As part of its celebration of the 150th anniversary of the London Underground and in addition to the wonderful restoration of Metropolitan Jubilee Carriage 353, London Transport Museum is running a series of creative learning projects with community groups across London. These projects support their participants to undertake creative activities, inspired by the carriage and its heritage, which culminate in the display of a public exhibition. 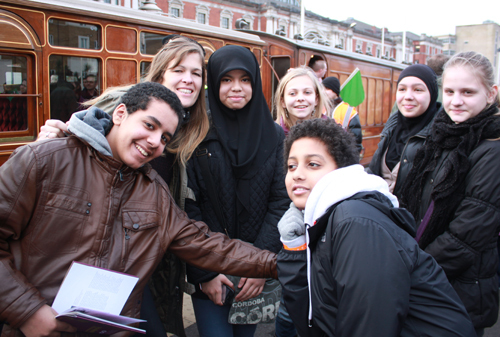 As well as discovering London Underground’s unique history and heritage, the volunteers also have the opportunity to undertake a relevant piece of accredited learning through the National Open College Network or Arts Award. All of the projects are inspired by the history & restoration of Metropolitan Jubilee carriage No. 353 and our volunteers have created a range of interpretative exhibitions based on what they have discovered which have included photographs, story-telling, film, posters, songs and a huge ‘carriage through time’ installation. The exhibitions have enthused local people to find out more about the story of carriage No. 353, London Transport Museum, the 150th anniversary of the London Underground and their own local heritage. The project has been made possible thanks to funding from the Heritage Lottery Fund and London Transport Museum Friends. Over the course of the project, the blog will reflect the stories and achievements of some of our participants.